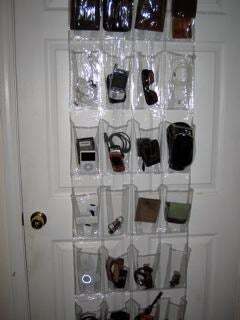 Reader Thom brainstormed a new way to use clear shoe organizers to organize all the gadgets laying around. I recently went to the local Container Store and found an awesome solution for the gadget whore. A plastic shoe holder that fits over my closet door is the perfect thing to keep track of all the little things that gets missed in the mad rush to work or the airport . Now I can have all my gadgets in plain view as well as all the cables and wires and attachments that seem to multiply when i bring home a new gadget. Great idea Thom. Some of our readers are going to need more doors!